The world is changing, and not necessarily for the better. Only the tragically blinkered still fail to see the converging crises of climate chaos, economic and wealth inequality, falling life expectancy, biodiversity loss, increasingly severe and numerous natural disasters, pollution, resource depletion, ecosystem destruction, and species extinction, swirling around us and robbing us of the better future we’ve been promised. What are we going to do about it? The problems are too big and too entrenched for individual choices to make any significant impact. Collective action is needed, and fast. The best time to have taken these steps may well have been decades ago, but the next best time is right now. 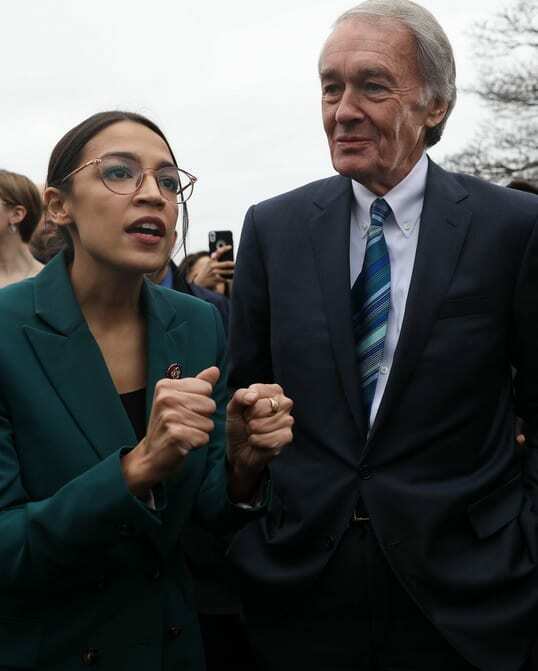 That’s why two of the more progressive Democrats in Congress, Alexandria Ocasio-Cortez (NY) and Ed Markey (MA), recently unveiled their Green New Deal resolution. Modeled on the economy-shifting resets of previous generations, and named with a nod to FDR’s stab at ending the Great Depression, the Green New Deal resolution is far-reaching, to say the least. The “green” part comes from the related goals of averting catastrophic climate change and shifting from fossil fuels to 100% renewable, emission-free energy sources by 2050. It doesn’t stop there, either. The resolution reads like a progressive manifesto, with mentions of guaranteed employment, a living wage, infrastructure repair and renewal, overhauling the transportation system, social justice, quality education, organized labor, and universal healthcare. Wow! Can we really do all of that, here on the down side of industrial civilization’s bell curve? As you might expect, reactions to the Green New Deal resolution were mixed. By now, we should expect the ideologically motivated to argue against any progressive policy in bad faith, and this one is no exception. For his FOX News show, Tucker Carlson got hold of a draft or doctored version of an informational sheet about the Green New Deal resolution which purported to offer “economic security for those unwilling to work,” a perennial conservative trigger. Cue the eyerolls. It’s a shame when Green New Deal critics choose to attack the concept with half-baked or fully fabricated talking points, though, when there’s so many honest criticisms and hard questions we should be asking about it. For instance, because nuclear power is missing from the resolution’s energy mix, it could result in increased greenhouse gas emissions, similar to what happened when Vermont promised to reduce emissions through the use of renewables and energy efficiency only. Of course, nuclear power, however carbon-free it may be, really ought not be considered “green,” especially in the broader sense of social justice outlined in the Green New Deal resolution. Radioactive waste has been piling up without a permanent resting place in the United States for decades. The real answer, that we can’t run Business as Usual on green energy alone, is too hard to swallow. Telling the difficult truth, that everyone would have to drastically scale back their direct and indirect energy consumption and make other systemic changes if we want to remain within critical ecological bounds, is a nonstarter for people who want to be elected to office. Right now, the Green New Deal resolution is just that – a resolution. It’s vague enough that most people can read either their fears or their aspirations into it (depending upon their politics), while being short on the kind of detail that would breed divisiveness, such as how to pay for all of this. It’s also unclear whether or not anything will come of it. House Speaker Nancy Pelosi recently seemed to write the whole thing off, calling it “the green dream or whatever they call it,” while noting that the newly minted House Select Committee on the Climate Crisis won’t actually be tasked with writing any legislation. It’s clear that something big must be done if we want to mitigate the worst outcomes of the predicaments heading our way and which are already beginning to arrive. Even if we have the means and the political will to do so, though, it’s unclear how the Democrats, even with a fully realized Green New Deal, will manage to avoid the natural consequences of a century and a half of growing levels of production and consumption while managing to give every American all the blessings of industrial civilization and the means to consume even more than they do now. The Green New Deal resolution aims to do everything with almost nothing, and that, in the end, may be the seed of its own undoing.